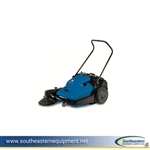 You can get a quality walk-behind power sweeper for a fraction of what you'd typically pay for a ride-on unit. Here you'll find some great options for reconditioned models, demo models and also a value-priced new model, the Minuteman KleenSweep 25. You have a variety of widths and options for battery-powered, gas-powered, LPG and diesel to choose from. The diesel-powered Tennant Green Machine 424 is a monster, with a 47" swathe and the unique capability to operate as a walk behind or a ride-on sweeper. Other commercial walk-behind floor sweepers are available from well-known manufacturers including Kent, Advance, Windsor and Nobles. Most are made by Tennant, a world leader in the manufacture of indoor and outdoor environmental cleaning systems. You'll find the used industrial walk-behind floor sweepers for sale here offer plenty of variety, great prices, amazing service and no-charge delivery costs.